The concept of Deemed Dividend under the Income-tax Act, 1961 (the Act) is not new. However, time and again many closely held company assessees and their controlling shareholders, to their surprise and dismay, realise very late the importance of this powerful taxing tool in the hands of the Assessing Officer. The concept of Deemed Dividend is embedded in Section 2(22)(e) of the Income-tax Act, 1961 and was also embedded in section 2(6A)(e) of the Indian Income-tax Act, 1922. In nutshell, the concept envisages taxing certain payments made by closely held companies by way of loans or advances to certain shareholders of the company or to the concerns/companies in which they have substantial interest. Whenever any payment is made by way of loan or advance, the recipient of the loan or advance will be liable to be taxed on this amount as a dividend, to the extent to which the company has accumulated profits, under the deeming provisions of section 2(22). However wef from A.Y 2019-20, the company giving such loan or advances shall be liable to pay tax, that is, dividend distributed tax 30% and not the recipient. Although such loan or advance may have been given for genuine business purposes and even if the paying company may have received back the loan amount. Thus the section deems certain payments as dividend income which is not income under ordinary commercial parlance. Therefore, the name Deemed dividend. The concept of deeming certain payments or loans or advances to substantial shareholders as income was introduced with the object of curbing tax evasion. 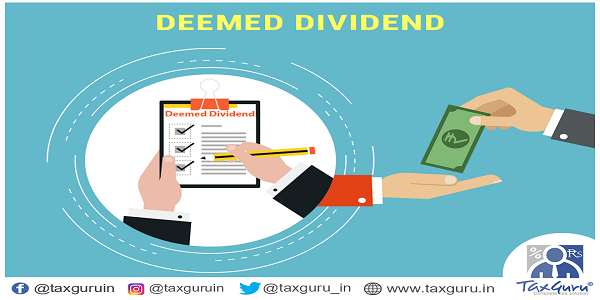 Upto 31-5-1997 dividend was taxed in the hands of the recipient of the dividend. However many closely held companies never declared any dividend and accumulated profits in the company itself. Since no dividend was declared the same could not be taxed. However the companies did give loans or advances to substantial shareholders or to their concerns/companies who presumably enjoyed these funds but were not liable to pay any tax on the same as the amounts were loans or advances liable to be returned. These amounts of loans or advances are sought to be taxed as dividend by section 2(22)(e) of the Act by way of a deeming fiction. Taxation of dividend under Income-tax Act, 1961 has undergone substantial changes in recent times. Effective from 1-6-1997 the scheme of taxation of dividend has been modified and is different from the old scheme. The essence of the old scheme was that the recipient of the dividend income was liable to pay the income-tax on the same, subject to certain exemptions. The new scheme essentially makes the dividend tax-free (section 10(34) of the Act) in the hands of the recipient (except cases covered under section 2(22(e)of the Act) and the dividend paying company has been made liable to pay tax on the amount of dividend declared , distributed or paid by it (Section 115-O of the Act). This tax is over and above the corporate income-tax which a company would normally pay. Recently there has been changes in the provision of section 2(22)(e), now the loans and advances given by the closely held company which is treated as deemed income will be liable to Dividend Distribution Tax and the company will pay tax @ 30% on such amount. Section 2(22) has 5 clauses (a), (b), (c), (d) and (e) which specify various types of distributions and payments as dividend. Clauses (a), (b), (c) and (d) mainly cover cases of distributions which entail release of assets or create liabilities. While clause (e) covers cases of payments by way of loans or advances and which is the clause mainly dealing with deemed dividend as it is commonly understood and has been dealt with in this article. In Kantilal Manilal v.CIT  41 ITR 275(SC) the Supreme court held that Section 2(22) deals with various types of cases and creates a fiction by which certain receipts or parts thereof are treated as dividend for the purpose of levy of Income-tax . In CIT v. Martin Burn Ltd.,(1982)136 ITR 805(cal) the Calcutta High court held that Under section 2(22) certain amounts which are actually not distributed are also brought within the net of dividends. Therefore, that section must receive a strict interpretation. Section 2(22)(e) has been held to be constitutionally valid in Navnitlal C. Javeri v. K.K.Sen, AAC 56 ITR 198 (SC). Section 2(22) starts with the words ” Dividend includes ………..”Thus the definition of dividend is inclusive and not exhaustive. Let us now analyse the clause in detail. Section 2(22) of Income-tax Act, 1961 defines “dividend” and is the main section for taxation of Dividend. Unless a payment or distribution is covered by this definition, it can not be taxed as “dividend”. Once an amount is covered as dividend it will be also considered as income as Section 2(24) (ii) of the Act includes ‘dividend’ within the definition of ‘Income’. Companies in which Public are not substantially interested. As it is clear, clause (e) applies only to companies in which public are not substantially interested i.e. to companies which are commonly known as closely held companies. Section 2(18) of the Act defines a “Company in which public are substantially interested”. Section 2(22)(e) does not apply to listed companies, government companies, section 8 companies, companies having no share capital and declared by Board, mutual benefit finance companies declared by Central Government to be a Nidhi or Mutual Benefit society, companies in which one or more co-operative societies hold at least 50% voting shares throughout the year, etc. Clauses (a),(b),(c) and (d) of section 2(22) use the word “distribution” while clause (e) uses the word “payment” which means amount may have been disbursed to one or two or more shareholders and not necessarily be distributed to all the shareholders. Does it mean only payment by cash/cheque or will it cover loan in kind also? Whether a goods loan will be covered? In M.D. Jindal v. CIT  28 Taxman 509 (Cal.) it was held that Section 2(22)(e) is applicable even if a loan is given in kind. Thus a loan of goods or other assets will also be covered by the clause and it is not necessary that the loan or advance must be given in cash only. The shareholder may be even a corporate entity. Loan given by a subsidiary company to a holding company will be covered by clause (e). Section 269SS of IT Act specifies that ‘ for the purpose of this section,” loan or deposit” means ‘loan or deposit of money’. A loan creates a relationship of a lender and a borrower. Can a bonafide loan given to a major shareholder for a short duration be covered by this section? In CIT v. Bhagwat Tewari  105 ITR 62 (Cal) it was held that a bonafide loan for a short duration is treated as dividend if all the conditions of section 2(22) (e) are satisfied. What is the position when a shareholder has a current account with the company? When a current account shows a debit balance of the shareholder in company’s books, it will take character of a loan. Therefore, position after every entry will have to be ascertained. In order to attract the provisions of section 2(22)(e), the important consideration is that there should be loan/advance by a company to its shareholder. Every payment by a company to its shareholder may not be loan/advance. To be treated as loan every amount paid must make the company a creditor of the shareholder for that amount. If, however, at the time when payment is made, the company is already the debtor of the shareholder, the payment would be merely a repayment by the company towards its already existing debt. It would be a loan by the company only if the payment exceeds the amount of its already existing debt and that too only to the extent of the excess. If the shareholder has a current account with the company, the position as regards each debit will have to be considered individually, as it may or may not be a loan. In such case the debit balance of the shareholder with the company at any point of time cannot be taken to represent an advance/loan by the company; nor can the amount at the end of the previous year be alone taken as loan.CIT v. P.K. Badiani 76 ITR 369 (Bom.). Whether an overdraft taken by a major shareholder from the company will be covered as deemed dividend? An overdraft taken by a shareholder from the company is treated as loan and taxable as dividend if conditions of section 2(22)(e) are satisfied—CIT v. K..Srinivasan  50 ITR 788 (Mad.). If a loan is repaid before the end of the previous year, the section will be attracted? Yes, even if a loan is repaid before the end of the previous year the section will be attracted. In Tarulata Shyam v. CIT  108 ITR 345 (SC) the Supreme court held that under section 2(22) the liability to tax attaches to any amount taken as loan by the shareholder from a controlled company to the extent it possesses accumulated profits at the moment the loan is borrowed and it is immaterial whether the loan is repaid before the end of the accounting year. Every sale of goods on credit does not amount to a transaction of loan. A loan contracted no doubt creates a debt but there may be a debt without contracting a loan. Bombay Steam Navigation Company P. Ltd. v. CIT(1965) 56 ITR 52(SC). Whether Security deposit to a major shareholder for use of premises will be covered under clause (e)? Genuine security deposit without any element of loan may not be considered as a loan. Whether loans or advance to relatives of a major shareholder will be covered? Loans to relatives of substantial shareholders are not covered as loans or advances to the shareholder. However such loans or advances may be covered as” payment on behalf of or for the individual benefit” of the shareholder. If a majority of a company’s assets and income are from money-lending business, it will be proper to assume that lending of money is a substantial part of the company’s business. In Walchand & co. Ltd. V. CIT,(1975)100 ITR 598(Bom) it was held that the onus to prove these facts lies on the assessee. Clause (iii) to section 2(22) provides that “dividend” does not include any dividend paid by a company which is set off by the company against the whole or any part of any sum previously paid by it and treated as a dividend within the meaning of sub-clause (e),to the extent to which it is set off. This clause gives some relief to the assessee by way of avoiding double taxation as well as brings in some scope for Scope for tax-planning. Thus, if a loan is already treated as a dividend it may make sense to declare dividend and adjust the outstanding loan amount against the dividend declared. No tax will be payable by shareholder on such dividend declared. However, if the loan has been repaid by the shareholder and nothing is due by the shareholder against the loan referred in section 2(22)(e), then no set-off would be possible. Also if the sum due by the assessee is on account of some other payments not covered by section 2(22)(e), then set-off will not be possible. It appears that liability to pay tax on distributed profits u/s 115-O can not arise in a case where a dividend paid by a company is set-off by the company as mentioned above, since the amount itself is not to be treated as a dividend. A benefit means some advantage to a person or something for the good of a person. A managing director of a company, whenever he needed money used to ask an employee to take a loan from the company and pass it on to him even without executing any pronote. Can he be said to have received any benefit? It was held that the loans made by the company to the employee fell in the category of “benefit” to the assessee managing director and were, therefore, assessable as deemed dividends in his hands—CIT v. L.Alagusundaram Chettiar  109 ITR 508 (Mad.). In one case, the assessee, having substantial interest in a company X, obtained from company Y two loans of Rs. 75,000 and Rs.2,00,000 on July 30, 1968 and September2, 1968, respectively. The question for consideration was whether these amounts could be treated as deemed dividend in the hands of the assessee under section 2(22)(e) on the ground that Y had made these loans to the assessee out of loans received by Y from X on the same dates. The Court held (in Nandlal Kanoria v. CIT  122 ITR 405 (Cal. )), that there was no loan given by X to the assessee. However, as the loan of Rs. 75,000 was given by Y to the assessee out of an equal amount received as loan from X on the same date, this amount was a payment by X for the benefit of the assessee and fell within the mischief of section 2(22)(e). The same could not be said of the loan of Rs. 2,00,000, as on the date of making that loan, Y had received loans not only from X but from another source also and the loan was made out of blended amount. In P. K. Badiani v CIT(1976)105 ITR 642(SC) the Supreme court held that Accumulated profits mean commercial profits and not assessed income. It does not mean the aggregate of the assessed income arrived at after disallowing disbursements and expenditure in fact incurred. In Navnitlal C. Jhaveri v. CIT 80 ITR 582(Bom) a question arose that while calculating accumulated profits depreciation as per books should be considered or as per IT Act? The Bombay High court held that while calculating accumulated profits an allowance for depreciation at the rates provided by the Income-tax Act itself has to be made by way of deduction. This is an important saving grace and assessees can claim substantial deduction for Income-tax depreciation out of accumulated profits. This will also call for separate calculation for accumulated profits as per income-tax Act and the same may be different from the accumulated profits as per books of accounts. As the Accumulated profits have to be commercial profits, additions made by the ITO due to concealed income can be included in accumulated profits. However, by the same logic, additions made by the Income-tax officer on account of inadmissible expenses or disallowances can not be included in accumulated profits. Whether balancing charge u/s 41(2)will form part of accumulated profits?.In CIT vs. Urmila Ramesh (1998) 230 ITR 422 the Supreme Court held that the amount of balancing charge under section 41(2) of the Act, did not represent Accumulated profits. Whether capital gains can be included in Accumulated profits? Presently Capital gains are covered by the expression ‘accumulated profits’ except capital gains arising before the 1st day of April, 1946, or after the 31st day of March, 1948, and before the 1st day of April, 1956. However, capital gains which are not taxable per se can not form part of Accumulated profits.Thus any distribution out of such non-taxable accumulated capital gains can not be treated to be taxable as deemed dividend. See CIT v. Mangesh J. Sanzgiri, (1979) 119 ITR 962(Bom). Thus capital gains on sale of agricultural land which is outside the purview of definition of “capital asset” as per section 2(14) of the Act should not form part of the Accumulated profits. Whether Revaluation reserves can be included in Accumulated profits? It appears that revaluation reserves can not be included in Accumulated profits as they are not in the nature of commercial profits as commonly understood and represent a mere book entry. Whether credit to Profit & Loss Account due to write-back of depreciation on account of change in method of depreciation will form part of accumulated profits? There is no legal bar to write back of Depreciation. As per Department of Company Affair’s view appearing in Company News and Notes, July 1 1963. However, since write-back of depreciation will be as per book-depreciation, while one needs to calculate Income-tax depreciation as per IT Act for the purpose of calculation of Accumulated profits, such write back will not have any impact on Accumulated profits. Development Rebate Reserve and Investment Allowance Reserve will form part of Accumulated profits. Provision for tax and provision for dividend can not form part of Accumulated profits.CIT v V. Damodaran85 ITR 59(ker. ).This is obvious because each of them represent a liability and is not in the nature of profits or reserves. In determining the Accumulated profits available for the purpose of section 2(22)(e), the amount treated as deemed dividend under section 2(22)(e) in past have to be excluded. CIT v. G. Narasimhan  118 ITR 60 (Mad). Thus it will be imperative for the company to calculate its profits and losses up to the date of payment of loan or advance and then calculate Accumulated profits (or losses).This date may be a date in between the two accounting years. In fact for every loan to such shareholder/concern the company may have to prepare profit and loss account up to that date. These words which are found in clauses (a) to (d) are not found in clause (e) of section 2(22) and, therefore, that provides some relief from the mischief of the section as well as provides some scope for planning .Thus it must be interpreted that to the extent of capitalisation of profits, accumulated profits would reduce for the purpose of this clause but not for other four clauses of section 2(22). What is capitalisation? It will ordinarily mean conversion of profits or reserves or income into capital as per Company’s Articles of Association. In P.K.Badiani v. CIT (1976)105 ITR 642 (SC) the Supreme court held that mere transferring of an amount from Profit & Loss account to the Development Reserve account or any other Reserve does not amount to capitalisation of profits. Similarly a transfer to General Reserve will not amount to capitalisation. The reason for allowing reduction of the accumulated profits to the extent of capitalisation of profits seems to be that to the extent of capitalisation, divisible profits i.e. profits available for distribution of dividend will reduce. A company can not distribute dividends out of capitalised profits i.e. capital. Thus if a closely held company wants to give loan or advance to a shareholder or his concern/company which are covered by this clause, it may first issue bonus shares (and thus capitalise the accumulated profits) and then grant such loan or advance. This is one sure way of escaping from the clutches of section 2(22)(e). However, it may involve expenses of filing fees and stamp-duty on increase of authorised share capital. Also a company may not want to increase its capital due to various other reasons. A question that arises is whether the quantum of deemed Dividend assessable in the hands of the assessee will be restricted to his share in the accumulated profits? In CIT v. Mayur Madhukant Mehta  85 ITR 230 (Guj.) it was held that there is nothing in sub-clause (e) of section 2(22) to restrict the deemed dividend to that portion of Accumulated profits which corresponds to the assessee’s shareholding in the capital of the company. If a loan is given by a company to a shareholder who owns 25 percent of share capital, the amount of loan to the extent of entire Accumulated profits (and not to the extent of 25 percent of Accumulated profits) will be treated as dividend. CIT v. Arati Debi  111 ITR 277 (Cal.). When a loan is treated as a deemed dividend and is repaid by the shareholder will it be added in the “accumulated profits”? Section 2(22)(e) must be so interpreted that once an amount goes out of “accumulated profits” as a loan and the loan is to be deemed as dividend the same amount when repaid cannot again be capable of attracting fiction and be deemed as dividend.. To avoid the happening of any such eventuality, the “accumulated profits” must be notionally reduced by the amount of all loans which are to be treated as dividends under section 2(22)(e) .CIT v. P.K. Badiani. 76 ITR 369 (Bom.). It is not the registered shareholder but the beneficial owner of the shares who is covered by the section 2(22)(e). Also the shareholding as on the date of the loan has to be considered. If preference shareholders are entitled to vote due to default in payment of dividend or in redemption, their holding will also have to be counted. As per Explanation 3(b) to Section 2(22) a person shall be deemed to have a substantial interest in a concern, other than a company, if he is, at any time during the previous year, beneficially entitled to not less than twenty percent of the income of such concern. It may be, therefore, worthwhile to first rearrange (by transfer gift or in any other manner) the shareholding pattern or profit sharing ratio to bring it below 20% and then grant a loan or advance to a concern or a company. However, other aspects of rearrangement like capital gain tax, etc. will have to be kept in mind. As per Explanation 3(a) to section 2(22 )”concern” means a Hindu undivided family, or a firm or an association of persons or a body of individuals or a company. Whether interest paid on loan which is treated as deemed dividend will be admissible as a deduction under section 57(iii)? Section 57(iii) allows a deduction for any expenditure (not being capital expenditure) laid out or expended wholly and exclusively for the purpose of making or earning such income. In Nandlal Kanoria v. CIT  122 ITR 405(Cal.) the Calcutta High court held that interest paid on loan treated as deemed dividend under section 2(22)(e) is not admissible as a deduction under section 57(iii ). Whether deduction u/s 80-L or 80-M is available for deemed dividend? Deemed dividends, like normal dividends, are eligible for deductions under section 80L or section 80M . However, from the assessment year 1998-99, deductions under sections 80L and 80M are not available in view of amendment/omission of the relevant section. It should be noted that now, in case of deemed dividend referred in section 2(22)(e) is not taxable in the hands of recipient, in fact the company giving such loans and advances is liable to pay DDT @30% on such amount. is loan given to a director from its own private limited co is cover under deem dividend.. kindly specify.. Very good article. But I have two querries. When the loan or advance is given to a director, this amount is to be treated in his hands as deemed dividend and he has to pay the tax on that amount accordingly and again this amount is reflected in his books as loan / advance which he has to repay to company. Then why it is not to be treated as income ? That means he has to pay tax also and has to refund the amount also. Then why the tax liability ? Thus by paying tax also, the amount does not belong to him permanently and it is his liability only. Second thing is at what rate company has to deduct tax on such advance / loan and under which section ? At what rate it is to be taxed in the hands of director ? whether at flat rate of 20 % or as per his slabs of income ? The case quoted by you is not covered under the provisions of deemed dividend. This is a normal pratice in the course of business to provide a collateral security by one entity in favour of lender to another entity provided no commission is received by the entity offring its property. Yes, you have to take care that interest on loan is repaid by the partenership firm and claimed by it as expense in its books. A Private Limited company is extending its fixed asset (property) to another sister concern (which is a partnership firm) to avail Loan against that property in the name of Parternship firm. Please note that the directors / shareholders in the pvt ltd company and partnership firm are the same. In case, will this transaction attract deemed dividend on the interest on Loan, even though the payment is made from the books of partnership firm, the Pvt Limited Company is also a co-borrower, as the partnership firm doesn’t have enough income to get the loan. Need your valuable suggestion on this asap. Section 2(22)(e)speaks only about the loans and/or advances to the major shareholders of the closely held Companies and treats the loans given to such shareholders as deemed dividend in the hands of such assesses but this Section nowhere speaks about the loans or advances given to a major shareholder who, in addition to being a major shareholder, is also a Director of the Company and is an employee of the Company as well. In my opinion, a Director (major) shareholder of the Company, being an employee of the Company should be specifically exempted from the provisions of Section 2(22)(e) of the Income Tax Act provided a loan or advance is given to such Director in the capacity of an employee according to the policies of the Company, on completing all the formalities prescribed in the Company Policy and no special privilege being given to such Director. A closely held Company may have the HR Policy to provide loans or advances to its employees for their genuine requirements so as to motivate its employees. If the Company can provide loans to all other ordinary employees of the Company, then why a Director, who becomes a major stakeholder of the company by way of his contributions for his shareholding, in the capacity of employee of the Company can not enjoy the benefit of the policy of the Company for his genuine needs? A Director shareholder of the Company, under normal circumstances, works more than an ordinary employee of the Company and in return, may or may not get remuneration from the Company. But, unfortunately, he can not get loan from the Company for which he is working as an employee for his genuine needs. As per my knowledge, a Director is treated as an employee of the Company and is covered under the definition of Officer in Default under the provisions of the Companies Act. Further more, a closely held Company is exempt from the provisions of Section 295 of the Companies Act which speaks about the “Loan to Directors”. But, to the contrary, he is taxed under provisions of Section 2(22)(e) of the income Tax Act for the loans given to him even as per policy of the Company? What a contradiction between two different laws prevailing on the common land of law! Where a Director shareholder and employee of the Company should go if he needs funds for his genuine reasons and is ready to abide policy of the Company and ready to repay the loan as per policy of the Company? There is need to refine this Section and insert a separate clause under the said Section to provide relief to Directors who may be major shareholders of the Company, if the loan is given to him in the capacity of an employee. Whether there is any case law which says that interest bearing loan will also be treated as Deemed Dividend if all other conditions are satisfied? Please give me the name of relevant case law. Thanks. please explain the concept of deemed dividend in a more simpler way……………..
it was lucidly explained above but still i didn’t understand. how the income is arising in case of such loans?????????? and how can it be taxed???????? Can a sec 25 company be converted to a shareholfing company? What are the procedures in companies act and Income Tax act to be abided by?